Last week’s flash flooding across north east Victoria meant rescue workers had to get innovative, and the Australian Rail Track Corporation was on hand to help. On Thursday flood waters cut the Hume Freeway around Wangaratta leaving motorists stranded when emergency services started enforcing road closures. But amongst them were a newborn baby and its parents and a very expectant pregnant lady and the SES made the decision that getting them to shelter was a priority. 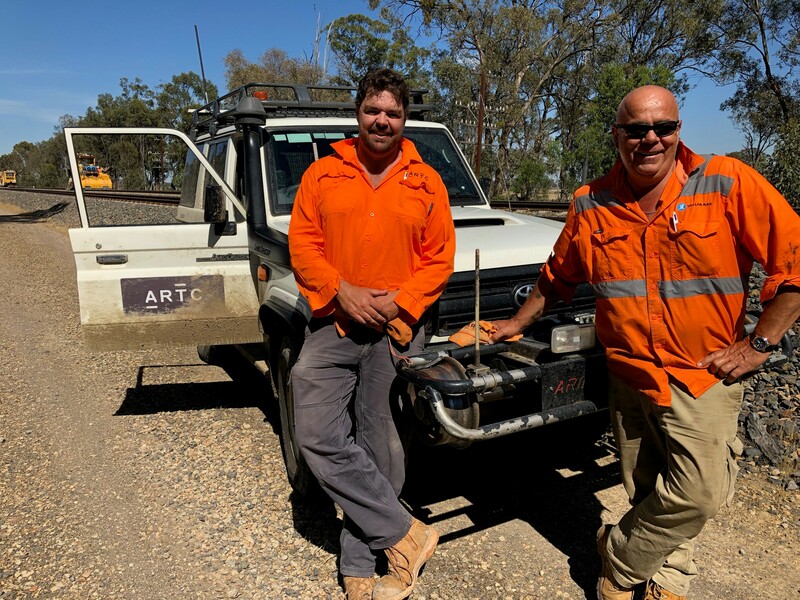 To do that they called on Nathan Grigg and the ARTC team from the provisioning centre in Wangaratta, and their Hy-Rail equipped 4WD. Fitted with rail wheels the vehicles can run on the tracks. While the floods meant the suspension of train services that didn’t stop ARTC’s Hy-Rail, and in short order the baby, her parents and the mother to be were onboard and heading into Wangaratta. Nathan Grigg (L) and Gordon Yates (R) in front of the ARTC Hy-Rail 4WD.